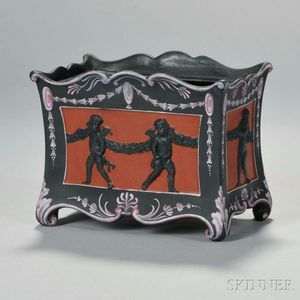 Wedgwood Encaustic Decorated Black Basalt Bough Pot, England, late 18th century, rectangular form with shaped rim and paneled sides, each with cherubs in relief supporting a laurel wreath to an iron red ground, bordered with flowers and foliage in red and white, upper-lower case mark, lg. 6 1/4 in. Missing lid; front rim restored; red ground panels possibly repainted.